If you are the seller or a high bidder -now what? Shipping Buyer pays for all shipping costs. Seller ships internationally (worldwide). See item description for shipping charges. 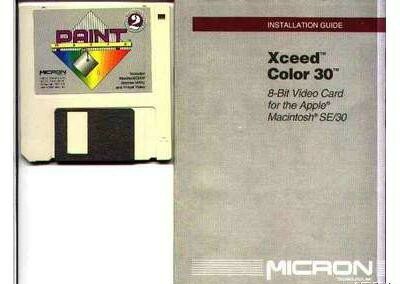 This is an Micron Xceed 8-bit color video card for a Macintosh SE/30, with original installation manual and driver disk. This card fits in the PDS of the SE/30 and drives a color Macintosh monitor at 640x480 physical resolution. The software driver allows a panable virtual desktop of up to 1024x1024 pixels. You are still able to use the built-in monitor of your SE/30 along side the color display. The video card (not shown) is presently installed and working in a Macintosh SE/30 with a burned out internal video display. The winning bidder may choose the Xceed video card with or without the SE/30 (in other words, to save you shipping, I can remove the card and throw the machine out for you). Buyer pays actual shipping charges for the card or the card and computer. For next business day shipment, payment accepted through PayPal (http://www.paypal.com). Money orders and personal checks are also accepted, but item will ship upon receipt of money order, or after personal checks have cleared. "Visa" "MasterCard" "Discover" "American Express"
A bidder asked whether the SE/30 has the Xceed grayscale adapter (that allows the Micron Xceed card to display grayscale on the internal SE/30 monitor). No, alas, it does not. This card can drive the adapter if you can find one, but they are *very* rare. $5.00 charge for removing for shipment individual parts other than the Xceed card itself.